Two things. First, thanks to the mod who stickied the thread (if it was you Steve, then you'll get some extra Duce for it). Second, to all my readers (if there are any), are you interested in me adding Clan Crests to the posted clans? This has been something I've toyed with for some time, but will do it only if there is any interest. They would be text only, as I can't really draw. Fishing has been a source of food for humanity since humans learned to use tools. This ancient art has become a source of commercial income for many companies since then. The majority of saltwater fish come now from Venus, with freshwater fishing being predominant on Mars. Mandatory Skills – Pilot, Resistance, Survival. Elective Skills - Animal Handling, Athletics, Willpower. Signature Skills - Athletics, Pilot, Resistance, Survival. The clan will also have rules for Tikis, thanks to the fact that other clans have Rune Magic. Added descriptions to civilian rifles in my second post. The Interceptor SMG is a good weapon, fulfilling an important role in the Imperial armory. It is however completely unsuitable for certain tasks. It is too heavy and cumbersome to be carried in one hand, it is also too large to be easily hidden. To counter these deficiencies Lyon & Atkinson has created two modified versions of the Interceptor, the silenced IIIs Eliminator and the light IIIc Vindicator. The design of the IIIc included the removal of the grenade launcher and the overall stripping of excess weight to balance the SMG for one handed use. Intended for close combat special forces, the IIIc Vindicator has recently been issued in small numbers to the Wolfbanes and Highland Clan Warriors for testing. Created by the famous designer John Tolliver, the M28 has become a staple weapon for many groups, including those belonging to the criminal underground. The relatively heavy construction of the SMG offers a stable platform which coupled with the drum magazine allows for sustained fire, making the SMG a mix of features normally found in Bauhaus and Imperial designs. To keep the M28 from being too demanding on the user Tolliver chose a light pistol caliber, using a stronger round would make the recoil unbearable. A classic piece of military uniform, the leggings support the ankles of soldiers and protect them from mud, dirt, small rocks, and sand getting into their shoes. The armored version is made out of ballistic nylon reinforced with flexible strips of metal sewn between two layers of material. These protect the legs from shrapnel and ricochets. A different form of leg protection is represented by greaves, padded plates of metal covering the lower leg up to the knee. Changed the equipment of the Highland Clan Warrior to be more in line with the version presented in the Venusian Apocalypse preview (different armor). Changed light infantry equipment to reflect the addition of the leggings/greaves (Bauhaus/Capitol/Imperial only). The attached image shows a 2ed Warzone capitol light infantry soldier, wearing a ballistic nylon uniform with shoulder pads and leggings. A few ICs today, I'm finishing up other stuff. Prerequisites: Imperial, Military primary career or Intelligence Operative primary career, Observation Expertise 1. Mandatory Skills – Insight, Observation, Stealth. Elective Skills – Close Combat, Ranged Weapons, Unarmed Combat. Signature Skills – Insight, Observation, Ranged Weapons, Stealth. Talents – Two talents from Insight, Observation, Ranged Weapons, or Stealth. Description of the unit can be found on page 87 of Imperial. The infamous Wokou Raiders prowl over the Venusian waves capturing ships and people belonging to other corporations. From their hidden lair island of Ochoku they make the Venusian sealanes dangerous. The majority of the Wokou are commoners lured towards a life free of the oppression common to the rest of Mishiman society, or renegades and outlaws of other corporations. They band together in mutual support of each other, with bands competing with each other over who brings in the biggest hauls. The leaders of the bands often style themselves as pirate-samurai, which isn't far from the truth since many captains are ronin, who have forsaken Mishiman society for the freedom of being a pirate. Mandatory Skills – Athletics, Heavy Weapons, Pilot. Elective Skills – Close Combat, Ranged Weapons, Survival. Signature Skills – Athletics, Close Combat, Heavy Weapons, Pilot. Talents – Two talents from Athletics, Close Combat, Heavy Weapons, or Pilot. Equipment – Swamp Skimmer, Sword. Based on the identically named real-world pirates. The Free Shooters are a development of the Ducal Militia and the Reserves. The first Free Shooters were reservists and militiamen raised to defend the land against the invasion of Imperial forces, and since the fighting never really stopped the unit was kept permanently staffed. Coming from the beleaguered province of Matochekland on Venus, they are superb outdoorsmen and marksmen who over time have become a part of the regular military establishment. Their tactics are based upon ambushes and marksmanship, with the enemy rarely seeing what hit them. Prerequisites: Bauhaus, Military (Basic) Primary career. Mandatory Skills – Athletics, Ranged Weapons, Survival. Signature Skills - Athletics, Ranged Weapons, Survival. Talents – One talent from Athletics, Ranged Weapons, or Survival. Inspired by the francs-tireurs and my ancestors in the Silesian schützen. The Special Crimes Division deals with the darkest cases the Bureau receives. From heretical cults to dark monsters, the SCD is tasked to destroy them before they damage Capitols population. Most of the work performed is investigative in nature, the Bureau's agents aren't soldiers in heavy armor. Their work is more subtle and challenging, since they cannot indiscriminately kill people that are suspect. Instead they use their powers of observation and charm to find out where to send in the Armed Interdiction officers with a warrant. As a dubious bonus SCD agents also deal with bizarre cases like sewer gators, masked vigilantes, and other strange events. Mandatory Skills – Observation, Persuade, Willpower. Elective Skills - Insight, Lifestyle, Ranged Weapons. Signature Skills – Insight, Observation, Persuade, Willpower. Talents – Two talents from Insight, Observation, Persuade, or Willpower. With their strange hairstyles, non-regulation talismans and face paint the Pathfinder Scouts stand in stark contrast to their parent unit. These superstitious madmen are responsible for the preparation of landing zones before an airborne landing. They are dropped from UH-19 helicopters to level landing zones and to serve as the coordinators for the deployment of troops. 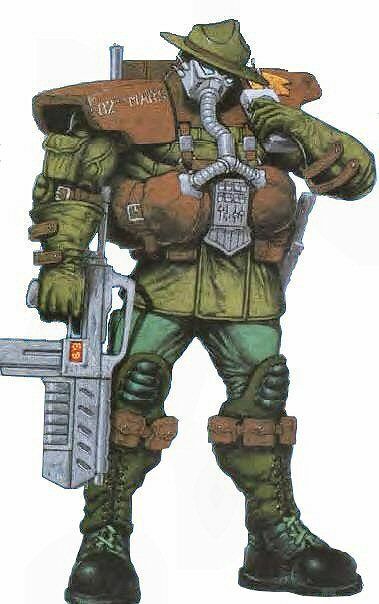 Their expensive training and light equipment precludes them from being used in active combat, but the unit has an unfortunate tendency to stumble upon dark legion patrols and Imperial infiltrators. This has led them to become famous from fighting against impossible odds and surviving. Elective Skills - Acrobatics, Close Combat, Stealth. Signature Skills - Athletics, Ranged Weapons, Stealth, Survival. Talents – Three talents from Athletics, Ranged Weapons, Stealth, or Survival. Equipment – Machete, HFMPS-ZR The Hare Mk. I armor, 4 Smoke Grenades (colored), Spool of Detcord. Special: Increase the characters Fame by one. A thin flexible tube filled with a quick exploding mixture, able to cut down trees and obstacles in a second. Sold in 300m spools. Effect: Using Detcord doesn't require a mechanics check. Wrapping it around an object is a standard action. Treat the explosion as a 2 + 5d6 (AP 2, Vicious 2) weapon. See page 60 in Capitol for a description. Prerequisites: Capitol, Athletics Expertise 1, Military primary career. Elective Skills – Acrobatics, Close Combat, Resistance. Signature Skills – Acrobatics, Athletics, Ranged Weapons, Survival. Equipment – M50A4 Assault Rifle, Knife, USMBS-73 Sea Devil armor. Aquatic – this weapon has been modified to work both underwater and on the surface. Whenever the weapon is fired underwater reduce the effective range by one step. Home: Hou Ao Island, Venus. The Iwi clan has been a part of the terraforming process from the beginning, providing subcontracted manual labor to anyone interested. The Rewa Agency Ltd. offered thousands of jobs under the ihupuku scheme during the terraforming of Luna, bringing unskilled and semi-skilled personnel to the construction of the Copernicus Spike, while undercutting the prices of their opponents. Since anyone signing the meager contract was taken, whole families and multiple generations were transported to Luna from the islands of Earth. After the terraforming projects ended and the Exodus began, the Rewa Agency showed its true face to the other corporations. Using a combination of cunning and brute force the company, now openly a part of Imperial, sabotaged dozens of valuable Capitol colonization projects on Venus and Mars, stole terraforming technology from Bauhaus, and set off a volcanic eruption near Quanto crippling Mishiman maritime shipping for decades. Sponsored by the MacGuires the new clan called itself Iwi, for an ancient term for both strength and tribe. The owners of the Rewa Agency Ltd. have then been accepted as the chieftains, with the most important families becoming sub-tribes within the clan. Thanks to their traditional tribal structure being very similar to the newly emergent clan structure, members of clan Iwi quickly established themselves as experts of clan law. Clan Iwi retained a lot of its culture in the centuries that followed, thanks to vigorous support from their leaders and financial grants for arts and crafts, the old traditions brought from Earth are alive and well. Among them are a predilection for facial tattoos, signifying the social status and family of the wearer, and the existence of the Kahunas, sorcerers able to create tikis which are like the rune magic of the other clans. Due to the ability to bind a fraction of the Light with tikis the Brotherhood takes a great interest in clan Iwi, to the point where the most talented children are granted preferred status when applying to a Brotherhood academy without the necessity of providing a tithe. The business of Clan Iwi has changed with time. Since they settled on the Hou Ao island east of the Graveton Archipelago their main source of income has come from fishing. Thanks to low-impact aquaculture methods brought from Earth, the clan has been able to maintain a steady output even after strong volcanic eruptions in the vicinity. Appearance: With dark skin, long black hair and their facial tattoos the members of clan Iwi are easy to spot. Even more striking are those among them who are naturally blonde. Contrary to other clans the Iwi do not wear kilts, in deference to tradition they wear fine cloaks made from flax with the most important Iwi clad in cloaks adorned with feathers. Trappings: Carved hardwood paddle (treat as a club); Belt buckle or shoulder pad with clan emblem; A set of traditional tattooing chisels; A fine flaxen cloak. Special: Members of Clan Iwi can learn how to create Tikis. Haka and Ta Moko – You practice the ancient traditions of tattooing and war dancing. These make you appear terrifying and dangerous to your enemies, while keeping others at bay. Gain 1 extra momentum for the first success on intimidation tests, increase difficulty by 1 on persuade tests when befriending others. Tohunga – Through practice and determination you have become an acknowledged expert in a single skill or field among your fellow clansmen. Among the Iwi this also requires you to pass on your knowledge to the next generation, so that your knowledge will not die with you. Gain one Momentum on Education tests to know things about your field of expertise. About the tikis, the rules and all things surrounding them are done. The only thing left is to stat up the effects of the tikis, so far I have 1 out of 9. I'll add the tiki rules here when I'm done, stay tuned. Legacy items are pieces of equipment created before the Dark Symmetry wrecked human technological progress, some are even older hailing from pre-Fall earth. Their sophistication and advanced design cannot be reproduced in the current era, with the exception of a Cybertronic lab. They can be found in old ruins, forgotten caches and abandoned asteroids. The Grey MD (Medical Database) is a small rectangular touch display containing a full database of humanity's medical knowledge before the Exodus. The device can help with the diagnosing and treating of any wound or disease known before the Exodus. Additionally it can, with the use of its pre-programmed educational system, train a person in both medical theory and practice. The display of the device also doubles as a photovoltaic cell, recharging the battery of the device while exposed to sunlight. Effect: Gain a point of Momentum for the first success rolled when making a Treatment or Medicine check. The device also doubles as a Medical reference library with a librarian, but with a test time of only two hours. The progenitor of the current powered armor designs, the ELBF was the child of the genius engineer/businessman T. Balcayne, whose ruin after the Big Scream allowed the other corps to appropriate the technology for themselves. This light-alloy exoskeleton allows the wearer to adapt the modular design to be worn comfortable over any type of clothing or armor. A set of rechargeable batteries in the small of the back powers the construction. Effect: Add 20 to the basic Encumbrance limit of the character wearing the ELBF. The character gains the Power Assisted quality. Another creation of T. Balcayne and his ForgeWorks Inc. The RNP was an experiment in the creation of a military grade light armor material. The primary element of the material are nanotubes which are reinforced with a special two-stage epoxy, which produces light and durable armor plates. The first experiments were promising and several test batches have been created. Sadly the Big Scream destroyed the labs in which the canisters with the fluid were kept, to this day they wait to be found ready to be formed into armor plating. Effect: Halve the Encumbrance of the armor worn by the character. Does not apply to ballistic nylon clothing. This strange looking device consists of a massive backpack connected with a thick cable to a leather bracer/gauntlet containing a set of coils and a small mushroom shaped discharge unit. The backpack is made out of wires, copper and plastics. The main unit, shaped like a reverse teardrop, has twelve openings fitted with cylinders. When activated the cylinders all extend, charging the AEP. The device then either discharges one cylinder after another, or all cylinders at once. Discharging one cylinder after another creates an almost constant ray of electricity, while releasing all cylinders at once unleashes a single massive blast. The device has two modes of function, sustained projection and concentrated discharge. A fully charged AEP has 4 reloads, after expending them the device recharges one reload every 15 minutes. Electric – This weapon does not shoot bullets, instead it projects an electric discharge. The discharge ignores all types of armor. Special: Firing a concentrated discharge expends 4 reloads, if the device does not have four reloads it cannot be used for a concentrated discharge. Within the structured society of Bauhaus university students there exists a group which strives to uphold the ideals of honor and duty beyond what is expected. These students have organized themselves into corporations along lines of origin, interest or pursued career. They wear colored caps and ribbons to proclaim their membership and duel with each other to prove not only their mettle, but to preserve their honor. Prerequisite: One of the following Educations – Post-Graduate Technical/Scientific, Creative, Managerial. Status – Commoner or better. Skill – Add Close Combat to the list of Elective skills of your Education. Equipment – Gain a dueling saber or a dueling rapier, a pair of heavy civilian shoulder pads, bespoke suit. Special: Your character has a distinctive dueling scar on his face, a memento of his time in the Student Corporation. Gain a bonus momentum to any successful Persuade test when dealing with Bauhaus members. A member of a Student Corporation cannot become a member in the Reserves and vice versa. Recruited from close combat experts among the Hussars the Jungle Kommandos have garnered a reputation at being the best troops to send into the hellish jungles of Venus. With their trademark rotary shotguns chewing through both enemy ranks and dense foliage, they can deal with any threat trying to attack Bauhaus holdings in the Rings of Fire. 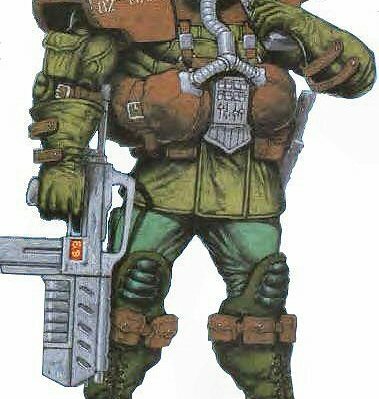 Units of Jungle Kommandos often range out before the main Bauhaus troops, in order to set up ambushes and traps against the unsuspecting enemy. Prerequisites: Bauhaus, Military (Hussar) Primary career, Survival Expertise 1, From Venus. Signature Skills - Athletics, Close Combat, Ranged Weapons, Survival. Talents – Two talents from Athletics, Close Combat, Ranged Weapons, Survival. Here's the Capitol Regional Origin, my attempt to make character creation for Capitol characters more interesting. I've based it on my knowledge of how American society worked around the WWII, where the place you grew up often had a greater influence on you than your education. I have made only one non-canon entry, the military brat, representing the uniquely American group of people whose society is the military. I've also changed the name of the Graveton Archipelago trade hub from Torkertown to Santiago, the fluff is the same. Enjoy and tell me if you like it or not. The citizens of Capitol are not cut out of the same cloth. They all are products of their environments, their families and their communities. Unlike the other corporations, the Capitolians all tend to be similar irrespective of the family wealth. Where in Bauhaus or Mishima children born to nobility will have nothing in common with the children of working class parents, in Capitol children born in the same locales will all have similar childhoods, all based on the type of corporate involvement in the area. And this is what makes life in Capitol great, for the shared heritage creates bonds stronger than steel. Roll one d20 or spend a life point to choose. Uniquely Captiolian, Lesser Mars is a good image of what Capitol is all about. Liberty and business join together to create a vibrant place where fortunes are made and futures destroyed . The people of Lesser Mars are sharply dressed and armed with a winning smile to reach for success. The working class district breeds hard-working people who can take it and can dish it back out. Whether a teamster or a factory worker, they are all prime models of the industrious Capitolian working class. A city within a city, the Bore is a place to relax and let your guard down. With many ways to pursue extreme sports it offers a unique place for people to grow up in. Those hailing from it tend to be leaner and more agile, and certainly more optimistic than the average Capitolian. There are many farms, plantations and settlements across the Graveton Archipelago. Some serve, like the Freedom Lands, as a refuge for people wanting to be left alone. Others are part of massive subsidiaries like the pineapple plantations of the United Farms of Capitol. They all share one characteristic, the Venusian jungle and all of its dangers are just a step away from them. The military center of the Capitol presence on Venus is a city devoted to war. Capitol's navy rules supreme here, the whole city exists solely to serve the South Sea fleet and the ground forces belonging to the navy, among them the Sea Lions. The tourist capital of the Archipelago and the main transport hub for the produce leaving for other Venusian destinations. The city has seen it all from traders, tourists, pickpockets, runaways and mercenaries. Anyone with business inside the Archipelago makes a stop here. The city itself is a mad jumble of old and new, business and pleasure. The only part of Capitol underrepresented in Santiago is the military, but even then the harbor district is fully with off-duty sailors and marines. The Capitol presence in Longshore goes beyond notional, both corporations actively trade with each other. With trade come legations, concessions and extraterritorial compounds, all staffed with Capitol shareholders. Many of which have gone 'mercurial', that is have lost themselves in the complex society and culture that is Mishima. The freewheeling city of Fukido is a nightmare for Capitol citizens, it is liberty gone wrong in every way. From the dens of iniquity to the spires of the cathedral, Fukido is one of the most intense cities to live in. Capitol citizens living here quickly learn that making a wrong move or choosing the wrong street might end their lives. Equipment – A handgun (Capitol or Imperial). Home to many shipyards and the navy, Eos also serves as a place for intercorporate conferences thanks to Peacekeeper Station. This turns the large asteroid into a hub of activity where navy personnel rubs shoulders with cartel diplomats and dockyard workers. Capitol maintains a series of mining outposts in the asteroid field. Their sole purpose is to provide the industrial complex of Caiptol with raw resources. The austere life in the colonies is compensated with large financial bonuses offered to the roughnecks working there. The true heart of the corporation is a massive melting pot of all the elements that make Capitol the greatest corporation in the Solar system. No single business or culture dominates here, not one dares to. Like a more vibrant version of Luna it is an awe inspiring marvel of human diversity. Steeltown is a place of hard labor and poisonous air, it is a monument to the fall of technology with its smoke belching forges and smelters. But without Valley Forge humanity wouldn't have enough weapons against the darkness. Like many cities on Mars Burroughs is dominated by the military, but aside from that it is also an important transportation center, a stop for the Trans-Martian railroad and a place of industry. And underneath it all is the constant war between various covert organizations fighting over secrets. A city of outlaws hiding behind the liberty espoused by the corporation. Nominally belonging to Capitol, it is a only a few steps away from being independent. A perfect place for people on the run or looking for independent employment. The canals are the blood vessels of Mars together with the Trans-martian railroad. They provide the verdant fields of the Freedom Lands with water and also serve as a source of seafood. A golden city of lights and entertainment, where all kinds of pleasures can be had for a price. With its alluring light it draws people wanting to forget about the dangers and horrors of reality. Some make it out alive and some lose themselves totally in the golden dreams the city has to offer. Equipment – A favour owed by a criminal group. If you aren't a tourist trying to catch a glimpse of the stars you are probably working for the “business”. Nowhere else on Mars does the media influence life as in Gilden. From the few thousand celebrities to the millions of people working to support them, the media companies profit from their toll. A shining beacon of civilization among the rural sprawl of the Freedom Lands. A place of both intellectual achievement and of thriving commerce. No aspect of capitol is ignored here, even the armed forces train here. With such diversity it's no wonder that Hope lives up to its name. Like a fort in the wilderness Shieldspar is a sign that Capitol will not abandon its claim to the Southern Lands of Mars. A city caught between the military and the inhospitable reality of the Southern Lands, it offers a unique vista of what capitol might become if forced to continuously fight. An inhospitable land that provides Capitol with raw mineral resources. A place of nomads and miners, where war is a distant echo compared to the daily struggle and toil. Those who come from the desert find the rest of the solar system an easy place to live in. Home to a myriad of settlers, the Freedom Lands offer a home to anyone willing to work for a living. The people of the Freedom Lands maintain the values of the first Capitol pioneers, a love of liberty and self-sufficiency. Few settlements dot the inhospitable Ice Caps, those which try to survive are mostly havens for survivalists or escaped convicts. These small towns are all tightly organized, with idlers often thrown out into the cold. Survival there depends on hard work. People raised in one of the many TMR outposts have seen and spoken to all of the solar system, because everyone sooner or later boards the train. From Mishima envoys to Brotherhood pilgrims, they all take a break or get out at one of the outposts. And they all have a story to tell or a mission to pursue. Some are even willing to talk about it. The Capitol military is a separate society, with its own culture and vocabulary. Children raised in military families quickly learn to be outgoing and adaptable on the account of the frequent personnel transfers which throw them around the solar system like a ball. At home they are gregarious and disciplined, with an inborn love for military precision and stability. Equipment – Pair of Light Military shoulder pads. Continuing character creation, here are four noble families for Bauhaus players. House Crest: Mailed fist on a Bauhaus cogwheel. House Belmon is one of the most militarized families in the whole of Bauhaus, every member is expected to either serve in the Dragoons or marry one. Their estates are an eclectic mess spread around both Venus and Mars, with some either unused or rented out to other Dragoon officers. While the house itself is well connected to other military families it tends to ignore politics in favor of fighting in every conflict Bauhaus is in. This blinds them to the fact that many other nobles in Bauhaus consider them beyond reproach, a situation which could easily be used to elevate the house even further if the Belmons ever bothered with their standing. Other Notes: When attempting a Piloting test to operate a tank or other tracked vehicle – of any sort – a Belmon may roll one additional d20 if he scores at least one success. House Crest: Shark rampant on a Bauhaus cogwheel. House d'Estaing maintains one of the longest unbroken military traditions in Bauhaus, hailing from old Earth nobility of the seas. What's even worse the family has developed an inordinate amount of pride in their professional ability, making them insufferable to work with. If not for their skill and talent the Bauhaus navy would have barred them from serving within. Instead the d'Estaings serve in the Navy commanding whole flotillas protecting naval interests of the corporation on Venus. Recently several members of the family have taken to space travel, opening the possibility of d'Estaing members serving in the BWM, to the great consternation of its other officers. Other Notes: When attempting a Piloting test to operate a ship – of any sort – a d'Estaing may roll one additional d20 if he scores at least one success. House Crest: A swan within the Bauhaus cogwheel. House Kyburg makes its money in one of the most despicable ways possible, they are land speculators. Besides assessing the value of a piece of land they also make sure that the seller is in dire need to sell, often by being pressured by "Imperial" forces paid by members of house Kyburg. Many times after the sale prospectors working for house Kyburg find precious ores or other valuable resources, and with the threats to the land mysteriously gone the price for the parcels skyrocket. This has led to many inquests about possible connections between Imperial and house Kyburg, all of them however have been unfruitful. Other Notes: Members of house Kyburg start with five additional Assets but gain an enemy in the Bauhaus corporation. House Crest: Wyvern perched atop the Bauhaus cogwheel. Owners of Bauer Chemicals and the Plania Carbon Group, House Wolitzky is renowned for producing some of the best Bauhaus experts in chemistry. It also contributed some of the most fearless leaders to the Homebuilder military, in fact those members of the family who show no talent for science are politely sent out to serve in uniform. Both in business and on the field of battle the scions of house Wolitzky know no fear and boldly brave the odds put before them, to the point that many Nobles have remarked about their almost inhuman tendency to ignore obstacles and dangers. Many soldiers prefer not to serve under house Wolitzky officers, since their units are often volunteered for suicide missions. Other Notes: A member of house Wolitzky lower the difficulty of all mentally traumatic events by 1 (down to a maximum of 0). The difficulty of all charm attempts using Persuade increase by 1 (up to 5). I once wrote the structure of an Imperial clan up, and now it's time for the Bauhaus noble family structure. Enjoy. When the social hierarchy of Bauhaus was established the nobility transferred the rules and structures they used on Earth onto the corporation. These rules have remained unchanged since, a testament of their perfection. The system is relatively simple, nobility is divided into two broad groups, the ancient lines which established Bauhaus on Earth and beyond, and the nobility of letters to which all later creations belong. Both groups are equal before the law, with the ancient lines receiving much more respect due to their age. Both the Elector houses and Greater nobility belong to the ancient lines, with their cadet lines straddling the divide between the categories. One particular rule makes Bauhaus nobility different from Imperial and Mishima nobles, Bauhaus law does not permit subsequent creations of the same name. Names and titles are created once, and with the demise of the title holder they are struck from the rolls never to be seen again. For example, should all the heirs of house Rathausen die out, their possessions would be transferred to the De Vries cadet branch, which would then be raised to the former Rathausen titles as house De Vries. The internal structure of the family is simple, at the top sits the Paterfamilias (or Materfamilias if the house is ruled by a woman). He is the undisputed lord of the family and makes all the decisions concerning the family's interests. A paterfamilias also decides whether to disown unruly members of the family or punish them in different ways, like cutting their allowance. Directly after the paterfamilias comes the heir holding a special title of nobility reserved only for him. In many families, like those of the duke electors, the title held is a lesser iteration of the main title. In others it is a separate and specific title of nobility often associated with the main estate held by the family. The heir is most of the time deeply connected with family business and often functions as the right-hand-man of the paterfamilias. After the heir come the children of the reigning family. They do not hold titles beyond the right to the family name and noble status. They are mostly sent off to the military, married into other noble families, enter the brotherhood or join the family business as managers. After the death of their parents they establish cadet branches of the main family. The cadet branches make up the majority of all noble houses, since the noble status is inherited by all legitimate children. While still noble the cadet branches rarely possess titles and have little to no say in family politics. Many nobles belonging to the category try to strike out on their own and establish their own noble houses. The names of the cadet branches are mostly hyphenated, with the main lines name followed by the cadet branch name. -Wolitzky-Jasitz, owners of the Falken Chemietechnik GmbH. -Wolitzky-Stahlgard, which are in the process of establishing themselves as a separate house in the Freedom Lands on Mars. If successful they will be granted a new title as house Stahlgard. Here two new orders for Bauhaus characters (untested). One is based on the idea of the student corporation (see above). Requirements: The character must be at least Commoner and have both an academic education (Any education from column C (save for Brotherhood Apprenticeship), Brotherhood Educated or Langfrey) and a minimum expertise of 1 in Close Combat (can also be from a career or customisation). He can be part of the Reserves. Advantages: A member of a Student Corporation has the Network talent in Bauhaus Territory (if the character gained the regular Network talent, it stacks). He can also lower the TN, cost and maintenance for hiring Allies & Assistants (page 30 to 31 of the Cartel Sourcebook) by one each. Most student corporations allow membership in other corporations. If this is the case, you get the benefits only once. The Order of the Tankard is an example of for an order where a mutual hobby is the uniting bond between the members. Its main purpose is organzing wine tastings, beer tastings , liqueur tastings and and hard liquor tastings. Requirements: Strong Liver Talent or having other advantages which makes it easier to resist the negative effects of alcohol like being from House Dante or House Borgia. Advantages: Members of the order can lower the cost for acquiring alcohol by one if a chapter of the order is in the area. I have not forgotten this topic and to get back to where I was return with a new clan. Clan St. John-Ross is a clan that has abandoned Imperial to join Cybertronic, so I went with that and developed them accordingly. Before Cybertronic and their defection, before they became a shameful memory, clan St. John-Ross claimed a noble calling. They were visionaries who sought to replace that which could not be healed, to correct that which was corrupted, they were some of the best experts in bioengineering humanity has seen after the Exodus. Preserving the old knowledge which they brought from earth, members of clan St. John-Ross were said to be able to replace limbs and correct physical impairments, from crooked spines to weak eyesight. In the shadows of Luna some even whisper that the Immortal was once a scion of the house, a man determined to overcome a crippling injury so severe it left him a shadow of himself. Whether it's true no one knows, but the clan quickly integrated into Cybertronic, hinting at someone having intimate knowledge about how they worked. The clan during its existence was known as a connector between theory and practice, between the halls of academia and the hospital corridors. Its members were fond of switching between the two, creating new procedures and then testing them in practice. Contrary to the Finns they never adhered to pacifism, and with the coming of darkness grew to hate the Legion with a passion, as their pool of resources shrank due to the corrupting touch of the Dark Soul. Appearance: While never cold and distant, members of clan St. John-Ross never developed the warm bedside manner of their fellow practitioners. Their concerns were always of a global nature and even in failure they remained calm and collected, the exquisite scientist looking for solutions in spite of setbacks. The collective Imperial memory remembers the family as a group of unassuming men and women going about their business with a steady determination. PS: In the coming weeks I hope to finish some more Bauhaus noble families and the tikis for clan Iwi. When i get my hands on Dark Eden I'll see what else I can do. Following up, three more Bauhaus noble families. House Crest: Five pearls on a Bauhaus Cogwheel. House de Melo has a love and hate relationship with Mishima on Venus. On the one hand they trade machined goods to them, earning a hefty profit for the house and Bauhaus. On the other hand the de Melos see Mishiman Samurai as a pitiful mass of peasants putting on airs of nobility. With an overblown sense of self-worth duels between Samurai and the de Melo noblemen are common. And with every duel the house holds the Samurai in more contempt, as their style of dueling involves many deadly thrusts the katanas can't parry. But thanks to the many contacts, friendly and hostile between the family and Mishima, the de Melos are experts in handling representatives of Lord Maru. And when the corporations go to war officers hailing from house de Melo are often used to predict how Mishiman Samurai will react to Bauhaus tactics. Other Notes: Gain an enemy in Mishima. Gain a point of momentum for the first success in Education and Linguistics checks concerning Mishima. House Crest: A jackal's head on a Bauhaus cogwheel. “When the Gössingers speak, Bauhaus listens”. House Bernheim controls the majority of all media in Bauhaus. House Gössinger owns enough newspapers to stand against them. Where everyone expects Bernheim-owned papers to toe the line, the Gössinger dailies like the Heimburg Courant or the Neue Volksburger Zeitung, dare to question propaganda. Their untiring reporters present to the people as much of the truth as possible, earning admiration of the masses and the ire of the Ministry of Truth. And it all would have ended long ago with the house being dissolved and its members sent to the gulags, if not for the fact that the house-owned papers are fronts for the Ministry of Fear. The majority of the reporters are normal workers, but a select cadre belongs to a group of highly trained experts in subversion and infiltration. Their job is to seek out groups threatening the stability of Bauhaus and destroy them from within by stoking their egos and misdirecting their actions. Other Notes: Gain a high ranking contact in the Ministry of Fear. House Crest: Spiked Bauhaus cogwheel. At home at every trade meeting between corporations, the house Kolowrat has managed to cut out a niche for itself. Every large trade deal between Capitol, Imperial, and Bauhaus, has one of them adjusting the numbers and haggling over the quotas. When others dismissed them as ennobled accountants, they made friends with outsiders. Their contacts opened doors to them and they used their connections to grow in money and influence. Many scions of the house have been astonished to find that their opens the doors in far away places like San Dorado and Victoria. With their size growing and the family fortunes steady house Kolowrat has set it sights at becoming more than just another noble family. Other Notes: Thanks to a large network of connections a Kolowrat is rarely without contacts in Capitol and Imperial. Roll an Average (D1) Lifestyle test to look for a family business contact in a Capitol or Imperial controlled location.